It is the little whisper that is coming from deep inside of you. The murmur you always seem to hear in your belly, when you need an answer. The soft and confidential tone of voice when something doesn’t feel right. When you hear the rustle of your Souls secret message, listen very carefully. Learning how to trust and respect our inner feelings takes time. We have been convinced to believe only what can be proven scientifically is real and justifiable. Why would you want to use a voice you can’t even hear to help guide you through life? The fact is, your ‘gut’ feeling holds the biggest tool in your inner tool box. The one piece of equipment that you can rely on, without a doubt – and it is your Intuition. Your intuitive nature is more than a hunch, it is your sixth sense. A natural, instinctual component of who you are. An ability to understand something immediately, without the need for reasoning. Our intuitive bridges the gap between our conscious and unconscious mind. It is a phenomenon of our mind and comes from a Latin verb, translated as ‘to contemplate’. Begin to listen more carefully to that ‘feeling’, when you know you should, or when you know you need to. 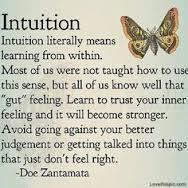 Your intuition is your very best friend. A trusting companion that is by your side, and willing to help you all of the time.